"Sweater" redirects here. For more uses, see Itchy Sweater. The Ridiculous Sweater Mouse is an Event Mouse found during the annual Great Winter Hunt event. This poor mouse is now doomed to wear this sweater forever... or at least until Grandma leaves and every time she visits. Information on how to locate and capture the Ridiculous Sweater Mouse can be found on the current Great Winter Hunt location page. 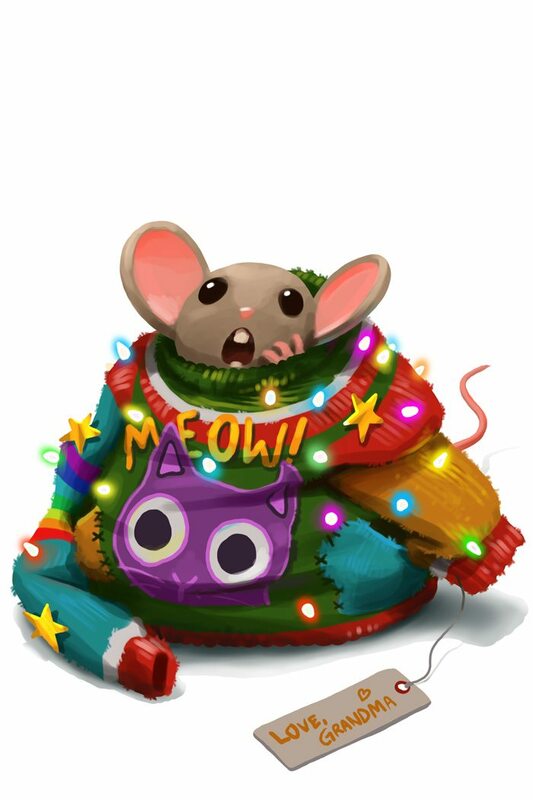 19 December 2012: The Ridiculous Sweater Mouse was released as part of the Great Winter Snowball Fight event. The image of the Ridiculous Sweater Mouse includes a sweater with a picture of a cat saying "MEOW!" and a tag that says "LOVE, GRANDMA". 13 December 2016: The points/gold for Ridiculous Sweater Mouse were changed.